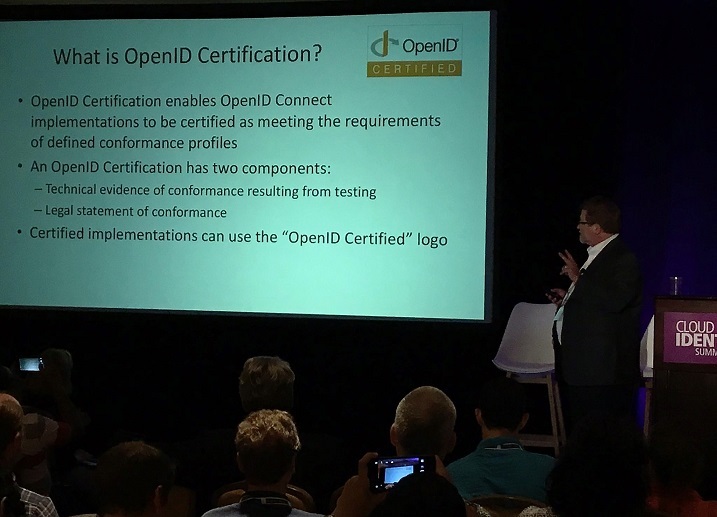 I gave an invited presentation on OpenID Certification at the 2016 Cloud Identity Summit (CIS) this week. I used the presentation as an opportunity to inventory what we’ve achieved with the certification program since its launch in April 2015, and while the numbers are impressive in and of themselves (90 profiles certified for 28 implementations by 26 organizations, with new certifications in May by Clareity Security, Auth0, and Okta), there’s a deeper impact that’s occurring that the numbers don’t tell. The new thing that’s happening this year is relying parties are explicitly asking identity providers to get certified. Why? Because certified implementations should “just work” – requiring no custom code to integrate with them, which is better for everyone. This network effect is now in play because it provides business value to all the participants. While I’ve spoken about certification about 10 times since the launch, this presentation is different because it tells this new story that’s playing out in the marketplace. Check it out in PowerPoint or PDF.